Listed below are properties where the City is aware that tree removal is planned in accordance with the Interim Urban Forest Bylaw. Colwood's urban forest is declining every year, and much of this loss is occurring on private land. In 2018, Colwood Council adopted an Interim Urban Forest Bylaw to preserve trees on both private and public property and to assist in protecting the City's urban forest. If you wish to cut or remove a tree on public or private property, please contact the City first. Read more at www.colwood.ca/Trees. A Public Hearing is scheduled for Monday, March 11, 2019 to provide an opportunity for public feedback regarding Land Use Bylaw amendments to the definition of flanking streets and front lot lines, and to add wording regarding small car parking and pet day cares. A Public Hearing is a vital part of Council’s review when applications are made to change the City’s Official Community Plan or Land Use Bylaw. It provides the public with a way to present their views to Council on items contained in the public hearing agenda. It is not a question and answer period. The Public Hearing is Council’s opportunity to listen to members of the public to hear their views or receive their written submissions on items contained in the public hearing agenda. Council is not able to discuss and debate the topic at the public hearing. A Public Hearing is scheduled for Tuesday, December 4, 2018 to provide an opportunity for public feedback regarding a Land Use Bylaw amendment to provide for the orderly development of the lands at 2330 – 2344B Sooke Road in Colwood. Listed below are development permits recently issued by the City. A development permit (DP) is issued to property owners following thorough review of a proposed development to ensure it meets the policies and objectives of the Official Community Plan, as well as the City's environmental and design guidelines. Please note: After a DP is issued, the proponent may apply for a building permit to begin construction. The City of Colwood does not endorse any information contained herein by parties not affiliated with the City of Colwood. Furthermore, the City of Colwood is providing the information contained within this website without warranty, guarantee, or further obligation. The City is not liable for any consequences or damages any individual may incur as a result of misrepresented, misquoted, or mistaken information. The Information Provided within this website is for Informational Purposes Only. 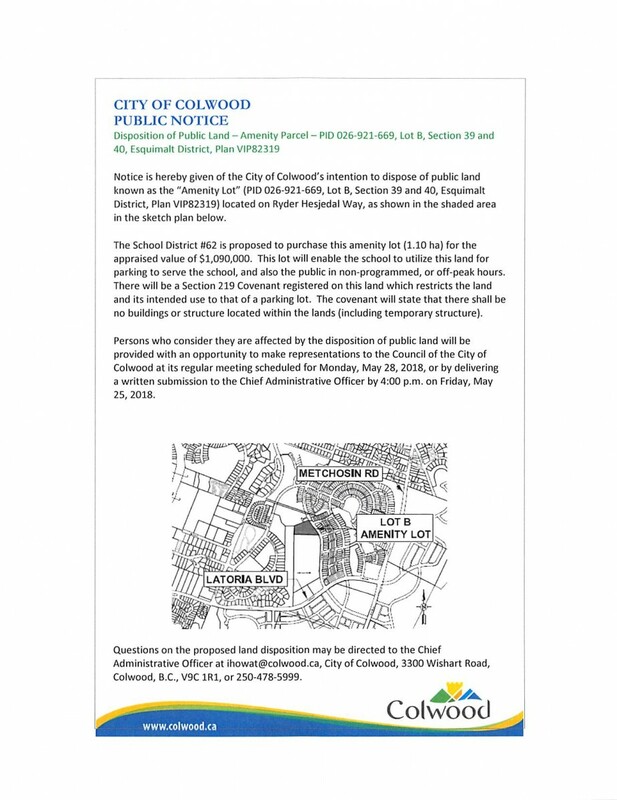 It is not meant to be an authoritative guide, and will not in any circumstances override any decisions or standards made or set by any representative or agent of the City of Colwood. School District 62 proposes to purchase public land located on Ryder Hesjedal Way for the appraised value of $1,090,000 so that it can be used for parking and/or recreation. This particular property is subject to geotechnical limits, and as such is not suitable for buildings or structures. Proceeds of the sale will be placed into a capital projects reserve funds to contribute to the acquisition of field sites adjacent to the planned elementary school in Royal Bay.